What is a Mulligan in Golf? A mulligan, most simply put, is a "do-over" in golf. Hit a bad shot? Take a mulligan and replay that stroke. Drop a ball on the spot from which you just played, and re-play. The first (bad) shot is not counted. No. There is never a time, when playing under the Rules of Golf, that a mulligan is "legal." Mulligans are not allowed under the rules. But just because mulligans aren't "legal" doesn't mean their use isn't common and popular among recreational golfers. 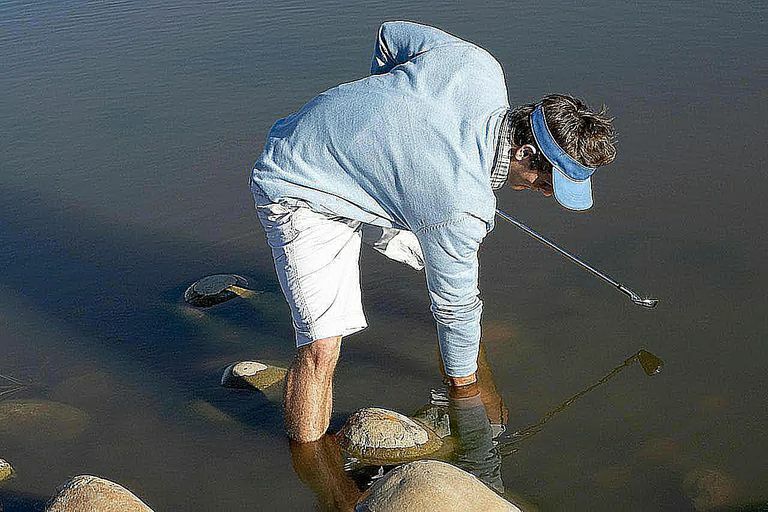 Many amateurs and recreational golfers - players just out to have a fun round with buddies, as opposed to serious golfers looking for competition - are lax in observing the rules anyway. So mulligans are most often employed during friendly rounds by golf buddies, or during charity or playday tournaments where mulligans are sometimes sold. If mulligans are for sale at a charity tournament, that means the golfer can buy, say, three mulligans for a set price each. The sale of mulligans is sometimes used as an additional fund-raiser at charitable events. Do all golfers use mulligans in the same way? No - whatever a group of golfers agrees upon is what counts (unless you are using mulligans in something like a charity tournament or association outing setting - then do what the organizers tell you). How many mulligans you get to use during a round, what types of shots you can use them for, and so on, are things that differ from golfer to golfer. So if you're playing with a new group and mulligans are in effect, you need to clarify what is allowed. Some golfers limit the use of mulligans to the first tee only, or to the first and 10th tees only. Some golfers use one mulligan per nine holes, but anywhere on each nine. It's most common for mulligans to be used only off the tee, i.e., you can only use a mulligan to replay a drive. However, some groups allow mulligans from the fairway, too. Less common is allowing mulligans from the rough or out of hazards, but some golfers even do that. It is rarer still - rarely seen, in fact - for mulligans to be used on the putting green. And some groups allow mulligans from just about anywhere on the golf course, but set a limit - say, three mulligans per round, or nine, or 18. Clearly, there are many different ways that golfers use mulligans. If you have a regular group of friends you play with, and your group allows mulligans, you probably long ago settled into your own "rules" about using them. Note that mulligans are common in the United States, but rarely seen in the UK, for example. As with all localized golf customs, formats and betting games, when playing with golfers you don't know clear up the ground rules before play starts to avoid possible confusion later. And again, please note: If you are playing in a tournament, handicap round or another setting in which the Rules of Golf are strictly followed, you cannot play mulligans. Why Is It Called a &apos;Mulligan&apos;? Good question! And the fact is, nobody knows for sure how a do-over in golf came to be called a mulligan. There are multiple theories, however. Mulligans can be called by several other names: "mullie," for short, and synonyms include Sunday ball and lunch ball. There are also several golf games that are based on mulligans, which are closely related (in some cases identical) but go by many different names including No Alibis, Play It Again Sam, Replay and Criers and Whiners. Want usage examples? "Bob's drive was terrible, so he took a mulligan." Another one: "Are we playing mulligans today?" "Yes, one mulligan per nine, but only off the tee."